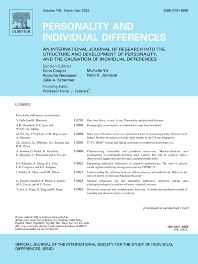 Personality and Individual Differences is primarily devoted to the publication of articles (experimental, correlational, theoretical, expository/review) which enhance our understanding of the structure of personality and other forms of individual differences, the processes which cause these individual differences to emerge, and their practical applications. Accessible methodological contributions are also welcome. The Editors invite papers that focus on the genetic, biological, and environmental foundations of individual differences, and possible interaction effects. While we recognize the importance of questionnaires for the measurement of individual differences, we encourage their link to experimental and behavioural measures. Ultimately the editors of PAID view human beings as bio-social organisms and that work on individual differences can be most fruitfully pursued by attending to both these aspects of our nature.